Tm mauritanicus : 10: female ad. The voice : the cries of the Blackbird include a “chacha-chacha-chacha” deaf, accelerating and for several seconds when the bird adopts a behavior of alarm.He also emits a “tchic-tchic-tchic” acute, repeated, in the dormitory or when he is worried.The flight cry (migration or erratic displacements) is an “endless” which can also be emitted when he is in a position of listening to a danger or a congener The nuptial (territorial) song, issued from March to August, is melodious and flutey but less repetitive than the song thrush.The different “races” have developed variants to this repertoire corresponding to T. merula. Geographical distribution of “subspecies or races”: Tmmerula: all Europe, from Iceland or the British Isles in the east to the Urals. In the south, Iberian Peninsula, Balearic Islands, France, Corsica, Sardinia, Italy, Sicily, Balkans. Introduced in New Zealand and Australia. Tmazorensis : Azores; Tmcabrerae : Madeira and Canary Islands; Tm mauretanicus : central and northern Morocco, Algeria to northern Tunisia; Tmaterrinus: Hungary and the Balkans, southern Greece, Crete, Caucasus and northern Iran; T .m.syriacus : Mediterranean ridge of Turkey, western Syria, northern and central Israel; Tmintermedius : central Russia, western and northern Afghanistan; Tmmaximus : east of Afghanistan, Pakistan, southern Tibet, erratic breeder in Nepal; T .m.mandarinus : central China, recently to Cambodia; Tmsowerbyi : Szechwan center;Tmnigropileus : western India to southern Rajasthan; Tm .spencei : east of India; Tmsimillimus : southwestern India; Tmbourdillioni : south of simillimus; T .m .kinnisii : Sri Lanka. Determination of age and chronology of moulting : in addition to the plumage criteria mentioned above, the adult (Ad) can be distinguished from the young in his first year (1Y) by the examination of the first rector (central 1st TF . ): cf: figure (in 16). Adult moulting is complete after the breeding season, from August to early November. Some individuals may complete their moulting only in December. Southern populations moult earlier than northern populations. Juveniles have an incomplete moult (head, body, medium cover) about 6 weeks after fledging, from July to the end of August. Their moult is complete in October. Common species with wide distribution and therefore wide range of habitat. It lives in deciduous forests (beech, oak …) or evergreen (pines, green oak, cork oak ..) but always with a shrubby undergrowth; maquis, scrubland, moors with fewer trees but shrubs up to 2m including juniper, wire, bramble; edges “forests-cultivated plain”; agricultural areas with large hedges and streams, parks and gardens with a clear tendency to increase populations in urban and suburban areas. The blackbird is also present on small islands, coastal thickets. It avoids large coniferous plantations without undergrowth and prefers mosaic habitats where alternating cultivated fields, hedges, groves. On the other hand, it adapted well to the consequences of the “freezing of the lands” on the habitats and benefits in particular from the multiplication of wastelands with a development of berries shrubs useful for its food. In Europe, it can live above 1000m but more than 4000m in the Tien Shan and the Himalayas and at 4600m altitude in western China. In North Africa it is present up to 2300 m of altitude. Its diet varies during the seasons but is composed of insects and their larvae, spiders, myriapods, small snails, worms and fruit: apples, pears, cherries, strawberries, raspberries, currants, cottoneaster berries, ivy, junipers, mountain ash, blackberries, yew, mistletoe, holly, elderberry. In the Mediterranean zone in the scrub and scrubland, it is mainly juniper berries (Juniperus sp with notably J. communis, and J. oxycedrus), wicker (Phillyrea angustifolia and P. media), traveler madder (Rubia peregrina), which are consumed especially in autumn during migration and wintering. 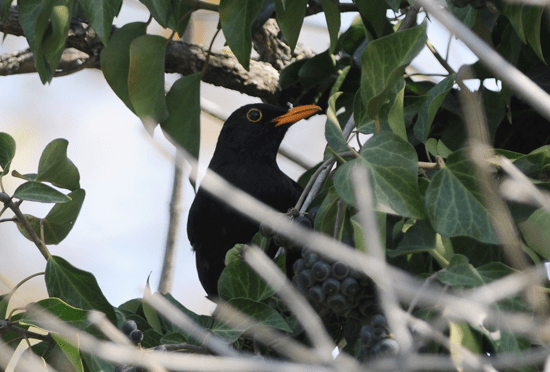 These indications are to be taken into account for the choice of plant species to plant in the case of reconstitution of hedgerows that remain in the agricultural zone the preferred habitat of the blackbird. Grapes maturing in September or left standing in small clusters after harvest are an important part of the autumn diet in the cultivated areas. The consumption of small vertebrates (lizards, frogs, small fish) may occur occasionally. The breeding season runs from March to the end of August; for the most eastern “races” it starts from April to July (simillimus: March-August, bourdillioni and kinnisii: April-June, nigropileus: June-September). The beginning of breeding is correlated with latitude: 2 weeks later in Scotland than in the south of England. In the Czech Republic, laying starts during the last decade of April. In continental France breeding starts during the third dekad of February and in Corsica during the second week of March (7; 10). The average weight is 7.2 g with no significant difference between birds originating from Spain or T .m.cabrerae and those from Central Europe ( Tmmerula ). The size of the laying is 3 to 5 eggs (2-6). In England, the mean (N = 1904) is 3.87 per nest. The size of the clutches varies according to the season: 3.4, in March; 4.56 in May and 3.61 in June-July. Spawning of first-year females is lower (3.4) than that of adult females (3.8). Two to three broods are common with the exception of the northern range (usually 2). The eggs are laid every day. The egg lasts an average of 2.4 days.At the beginning of the season (March) this duration is greater. Incubation lasts an average of 13 days (12.6 in the Czech Republic, 13.7 in England). It is ensured by the female although the male could be observed on the nest. The young are fed by both parents for 3 weeks (average 19.6 days). The flight takes place 14 days on average after hatching. The age at first breeding is one year. Adult females are more productive than first-year females. The average rate of nest loss is 35.7% before fledging. The main causes of nest loss are predation, abandonment and infertility. The average number of young people raised per couple is 3.46 in suburban areas and 2.61 in rural areas. A Swedish study showed that out of 146 eggs laid: 54% hatched, 39% of the initial number produced fledglings, 32% beyond 5 days after fledging and 27% until fledging. independence 16 days after hatching. A recent European synthesis (2) puts the number of couples between 40 and 82 million in 44 countries. 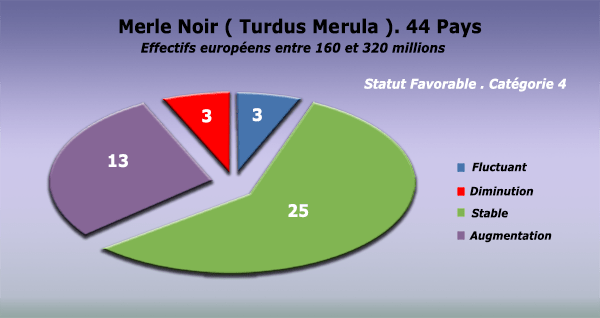 In France the numbers are between 1 and 6 million pairs; in Spain: 2.3 to 5.9 million; in Greece: 0.8 to 2 million; in Italy: 2 to 5 million; in Portugal: 0.2 to 2 million. The largest population is Germany: 8 to 16 million pairs, followed by the United Kingdom: 4.9 million pairs. 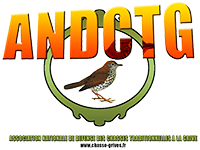 Current trends, as defined by Bird Life International, make it possible to classify the species in Category 4: favorable conservation status and secure status in Europe. Of the 44 countries covered by the 2004 synthesis, the species is stable or increasing in 38 of them, including those hosting the majority of European populations. It is decreasing in 3 countries: Albania, Croatia and Turkey. Assuming an average production of 2 young per pair before migrating, we can estimate the number of European migrant pre-migration between 160 and 320 million in the Western Palearctic region concerned by 44 countries (6; 17). Mortality rates vary by country. In England where the species is not hunted, the mortality rate is 58% the first year, 38% the second, 50% the third and 40% the fourth and fifth. Annual mortality decreased from 1951-1952 (50%) to 1960-61 (32%), and road traffic and feral cats play an increasingly important role in the causes of mortality. In Belgium, the annual mortality rate is 69%: adult mortality is 52.2% or 46% excluding the causes of mortality due to humans (hunting, road traffic). Juvenile mortality is 12.4%. In France the annual mortality in urban areas is 25% in males and 33% in females. In Germany this rate is 49% and 28% for urban populations; in Finland, the annual rate is 58-59%; in the Czech Republic, it is 68.4% the first year of life, 56.3% the second year and 30% the third year. Unlike other species of the genus Turdus, the blackbird appears unaffected by severe winters. The oldest known banded bird has reached the age of 20 years and 3 months. The species is composed of sedentary and migratory populations, with northern populations moving further south in autumn and winter depending on weather conditions. In general the populations of Scandinavia, England, Ireland, Denmark and Germany winter in Western Europe and the southernmost populations winter in southern Europe. Birds from Germany, Poland, Czech Republic, Switzerland and Hungary migrate south-west-west: in western France, Spain, Portugal, Baleares, Corsica, northern Italy and Malta . In winter, birds from northern Europe travel to Gibraltar, Morocco, Algeria, Tunisia via the Mediterranean coast. In Russia, a fraction of the population remains in the country in winter, but most migrate further south and east (Cyprus, Turkey). The “Aterrimus race” of South-East Europe, Caucasus and Turkey winters in Egypt and Cyprus. The movements of the “mauritanicus race” are not well known, but some rings in Morocco and southern Tunisia suggest displacement. The “Syriac race” is present from November to March along the eastern Mediterranean, in Sinai. Some cases are reported in Sudan, Jordan and the Gulf States. The most eastern populations are sedentary or make short trips depending on altitude or latitude. In November 1994, the first blackbird was found dead in the United States (Bonavista, Newfoundland) and is considered the first case of long-running erraticism from Europe to the new continent. The blackbird moves (migration and winter erratism) at night but also during the day. In autumn migration (post bridal) many cases of mortality are recorded in the North Sea in offshore oil wells. The fall migration begins in late September in the north with an intense passage in October which continues until early November. Young people can move from July to August. The departures of Russia begin in mid-September and continue until November which explains the succession of passages recorded further south in the Mediterranean zone by the bioacoustic stations installed in the Mediterranean basin and operating every night (6; ). In England and Ireland, in January-February, there is regularly an increase in bird recoveries from Sweden. Several cases of reverse migration could be noted: birds banded at Helgoland taken again 24 days later in Denmark, Norway and in the Isle of Fair. The return migration (pre-nuptial) begins for all the “races” at the end of February, with a first “peak” at the beginning of March and then successive passages until April or even some cases at the beginning of May (3; 4). Recent researches using bioacoustics associated with ground counts, show for France (south-south east), Spain and Italy (Arosio, Udine), that the very beginning of the migration intervenes during the last decade of February and that the “peaks” of migration follow each other, according to the origin of the birds, until mid-April (6; 8; 9; 11 to 18). During migrations (post and pre-nuptial), birds have a distinct tendency to gregariousness and fly in small groups of 5 to 20 individuals (9) remaining in visual or auditory contact during the night, emitting a characteristic call “tsîîh- tsîîh “thin and shuffling, a little lighter than that emitted by the Violet Thrush. 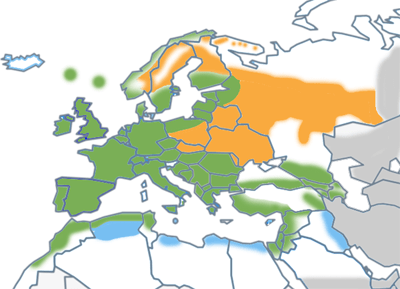 The dates of arrival in the breeding area vary according to the regions of Europe. In Sweden, the first arrivals are at the end of April; in Russia, they range from early March to early May; in Lithuania – Estonia-Ukraine, they ranged from 12 March to 12 April for the period 1971-1984 (4; 21). The blackbird has been hunted traditionally in the southern part of Europe since time immemorial according to different modes of hunting with or without callers, in front of oneself or at the fixed station. Harvesting is still imperfectly known. This species is hunted in France, Greece and Italy among the countries of the European Union. 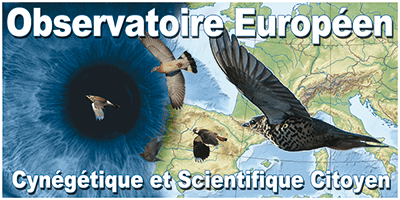 For France, the levies during the 1998/1999 hunting season (ONCFS / UNFDC survey) were estimated at 980 000 (± 3.3%), which represents between 0.3 and 0.6% of the estimated European numbers (cf: supra. ). In the future, it will be necessary to better understand the harvest of this species in Europe, in particular through the introduction of a sampling book as it is already in use in Greece and Italy, accompanied by management measures through the introduction of a seasonal quota for the levy adjusted to the European stocks and the results relating to the success of the breeding already in application for the exercise of the traditional hunting of this species. 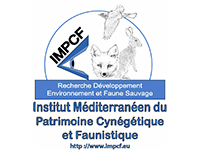 This objective requires strong collaboration between the countries concerned by the breeding area (central and northern Europe) and those concerned with wintering (southern Europe and North Africa). Non-governmental organizations, in collaboration with European and national hunting authorities, will therefore have to ensure long-term follow-up and essential coordination. The conservation of this species, whose status is very favorable at the scale of the Western Palearctic (2), also means reducing the causes of mortality at all life stages, particularly during migration (offshore oil rigs, lighthouses, high and medium voltage lines, road traffic) and decreasing predation especially on nests and chicks. Conservation of both breeding and migration (staging) and wintering habitats must be a priority. 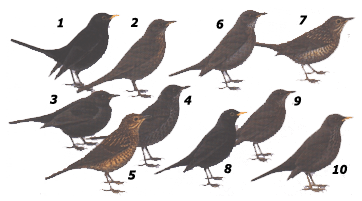 The diet of blackbird is very varied, which is a considerable advantage since its niche ecological food will develop various regions and complementary resources. Priorities include: the conservation of hedgerows and shrubs, the development of silviculture that tolerates a shrub layer, the maintenance of uncultivated Mediterranean spaces by promoting a mosaic landscape of alternating open and closed environments, encouraging in the reforestation plans, the planting of trees or berry shrubs, the basis of the spring and winter feeding of the species, the planting of hedges of structure (strata) and efficient composition (species) elsewhere which can be financed by the Common Agricultural Policy (CAP), in particular through agri-environmental measures at European level and aid from Member States or program regions.